Scented Secret Scrapbook and 20% off Discount! It seems like every little girl wants a pony. I can’t think of a single one I know that doesn’t or hasn’t at some point! This little scrapbook is perfect for any little girl! Check out this post to get a 20% discount code for this and other great products from SmitCo LLC! As a child, I would have loved this little scrapbook. As an adult, I’m doing my best to resist the temptation to keep it for myself. Haha. The stickers are super cute (and scented, what!?!) and the little pen has a perfect fuzzy accent for any little girl! This little scrapbook is made as one would expect for a little one that will love it like crazy for a few months. As an auntie, I know that it won’t last forever, but it will get a lot of love until my niece is done with it. She may not be able to have a real pony, but she can have these adorable stickers and this super cute little scrapbook! It’s funny to remember how gifts such as these meant so much for me as a kid that even holding them as an adult brings back the nostalgia of childhood. an Entire Cart Of Gifts Here! I’m not sure how long this will last, but I’ll leave it up until someone tells me it’s no longer any good. I always love Mommy inventors! The Jesus Sees Us Doll was created by some Mommy’s wanting to teach their little ones a little more about Jesus. I think this is a great idea as children need concrete things to better understand the world around them. 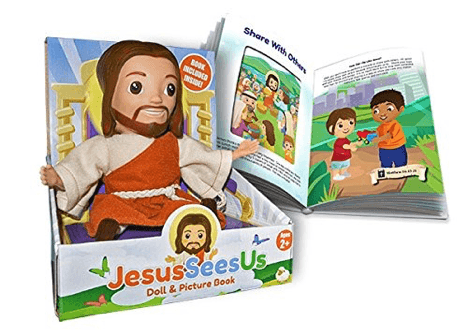 The book that comes with the the Jesus Sees Us Doll is full of lessons that we try to teach our little ones, such as being honest, sharing, helping others and other principles that help us all learn to be better Christians. The book is worded simply and each new thing it teaches has a scripture ‘address’ so that as they grow older we can look in the Bible to further our understanding not just of the lesson, but also of the Word. Give your children a gift they can carry with them always—faith! The Jesus Sees Us doll and book are so much more than just a doll and book. Jesus Sees Us is a beautifully relatable tool for introducing faith, Jesus, and His teachings into your child’s life. Children cling to things that make them feel secure and are drawn to the wonder of something they can believe in. Why can’t that belief be in Jesus and that security be their faith? The Jesus Sees Us doll and book are reminders that Jesus Christ is always with them, guiding and loving them every day! He will be by their sides to help them through tough times and to celebrate their victories! The doll will help remind your child of the lessons that Jesus taught while He was on earth. He is a huggable reminder that Jesus loves them and is always watching over them. He cares about the way they live their lives and wants to teach them how to be good Christians!